The conservative crusade to declare everything a “person”—corporations, fertilized eggs—will have disastrous consequences. 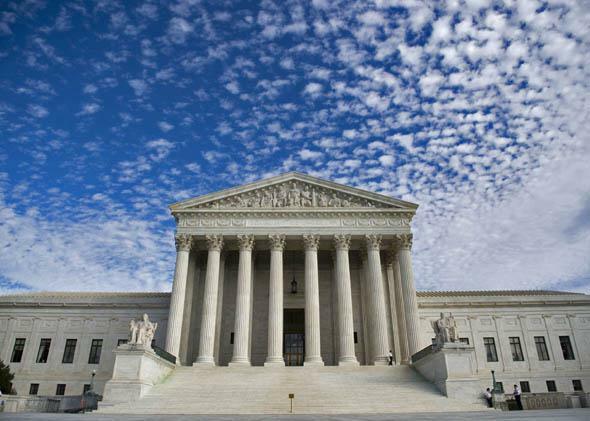 The Supreme Court will soon have to consider the extent of corporate personhood. But corporations aren’t America’s only new people. States and the U.S. Congress are also attempting to expand the definition of personhood in a different direction: Anti-abortion activists are attempting to redefine “personhood” to include the potential personhood of a fertilized egg. If the so-called personhood bills and ballot initiatives across the country succeed, a day-old zygote would have the same legal status as a person, with sweeping implications for criminal law, reproductive rights, and access to birth control. So pause for a moment with me to ponder what it means that some of the greatest civil rights battles of our era are being fought to extend personhood into the weeks prior to viability and the years after incorporation? What does it mean for actual human “personhood”—as well as for reproductive rights and corporate control—that, if the far right succeeds in stretching these two legal fictions to their illogical extremes, American “personhood” will begin at conception, diminish somewhat at birth, and regain its force upon incorporation? A brief review: In 2010 the Supreme Court determined in Citizens United v. FEC that corporations can be treated as persons for First Amendment speech purposes, although the notion of corporate personhood certainly long predated the case. While the final outcome of Citizens United didn’t rest solely on the idea that “Corporations are people, my friend”—that was Mitt Romney’s gloss—it certainly celebrated the notion that corporations have complex moral, political, and social needs that must be expressed in the same ways as the rest of us, you know, human beings. There is almost no way for the Supreme Court to analyze the Religious Freedom Restoration Act claims or the First Amendment claims raised in the two challenges to the birth control mandate without contemplating the prospect of corporate personhood. Certainly the two religious families that own the businesses challenging the birth control mandate argue that the law’s bar on government efforts to “substantially burden a person’s exercise of religion” applies to corporations as well as people. Hobby Lobby operates more than 500 arts-and-craft stores and employs about 13,000 people. It operates “in a manner consistent with biblical principles.” (It’s closed on Sundays, for instance.) Conestoga Wood Specialties is a Pennsylvania woodworking firm run by a Mennonite family that employs almost 1,000 workers. At least some appellate courts have been more than open to extending the corporate personhood metaphor as unfurled in Citizens United to include religious convictions as a component of corporate personhood. As the appeals court judge in the Hobby Lobby challenge explained in his majority opinion: “We see no reason the Supreme Court would recognize constitutional protection for a corporation’s political expression but not its religious expression.” Because there is no way for the courts to assess which religious convictions are heartfelt and which are merely opportunistic, there can be no limiting principle here. If for-profit secular corporations have religious beliefs, companies run by Christian Scientists can be free to limit medical treatment and those run by Jehovah’s Witnesses could object to paying for blood transfusions. Artificially created constructs that exist to shield owners from lawsuits will be able to shield owners from compliance with basic civil rights laws. It is a movement that has dramatically split the anti-abortion community into camps that seek either to champion the crisp intellectual purity of declaring that life begins at fertilization or to merely pragmatically push for earlier bans on abortion. The fracture within the anti-abortion community hasn’t stopped a slew of GOP members of Congress, various presidential hopefuls, and state activists from pushing for personhood legislation each year. Even when it makes no legal or rhetorical sense, it appears to be a powerful talking point. Conferring human attributes such as religious conviction and the capacity for embarrassment on a corporation is dangerous. Conferring human rights upon a fertilized egg is too. Progressives can be just as guilty as conservatives when it comes to this sort of metaphorical personhood creep, by the way. A suit filed this week in New York seeks to protect four chimpanzees as “persons” too. But whatever you may think of the ultimate goals here, when you designate a nonperson as a person, you devalue what it means, as a legal and policy matter, to be human. Hobby Lobby and Conestoga are ultimately so worrisome because they fuse together two of the most dangerous right-wing civil rights obsessions of our times: the ambition of large, for-profit corporations to see themselves as people, with faith, convictions, and consciences, and the attempt of citizens, using their own science and their own facts, to declare when legal personhood begins, and then impose universal laws based on those beliefs. The cases are a collision of two very insidious legal metaphors — that personhood begins when any one religion says it does and that religious personhood can be vested in corporations in ways that can be forced on workers. It simply cannot be the case that in a country of 319 million people, we are ready to recognize zygotes and Walmart as legal “persons.” We can protect animals and unborn babies and corporations without also embodying them with a humanity they don’t possess. Turning everything and anything into a “person” ultimately also serves to turn persons into things.